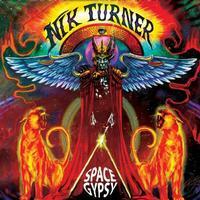 Nik Turner is probably best known as a former member of Hawkwind. For that reason, one might expect this disc to feel like Hawkwind. If that were the listener’s expectation, they would not be disappointed. Much of this feels like some lost Hawkwind tunes. Even when it moves from that direction, it’s just that the music is less retro and more modern. It’s not that it doesn’t sound like Hawkwind. This is actually quite a strong disc. It’s highly recommended to fans of Hawkwind or space rock in general. It should be mentioned that another Hawkwind alum (Simon House) guests adding his violin at times. Steve Hillage also guests. As this one starts off, more or less rising up from the previous tune, it reminds me a lot of something from the early days of Hawkwind. The saxophone weaves some melody before the vocals enter. This is very much classic Hawkwind sounding music. Many of Turner’s vocals here are spoken (much like “Uncle Sam’s on Mars”). The instrumental section includes both some tasty keyboard washes and more saxophone soloing. This one is sort of more melodic, but otherwise the same “classic Hawkwind space rock” description holds completely true. I really like some of the sounds on this one better than even the two opening tracks. The chorus is more accessible, too. In a change acoustic guitar opens this. It works to a mellower, but equally spacey song that still fits well with the Hawkwind sound. The flute that dances across the arrangement is a nice touch. Although there’s a bit more rocking vibe here, this remains mellower than the two openers. It’s dramatic, powerful and one of my favorite pieces here. This is almost worth of price of admission by itself. The extended jam later is suitably dramatic. It has waves of sound of all kinds dancing around one another. This is mellow space rock at its finest. A harder rocking tune, this one is perhaps not as strong as the rest of the disc. It does include some guitar soloing later that really calls to mind Hawkwind’s Doremi Fasol Latido album, though. In fact, in a lot of ways this cut feels like it could fit there. It just doesn’t seem to have as compelling a song structure as some of the other stuff here. Turner’s saxophone solo that serves as part of the fadeout gets quite noisy at times. Acoustic guitar opens this number. It turns out to a cool space rock meets folk and world music number. This is another mellow tune. It’s got a lot of dramatic moments, though. There’s a driving rhythm section to this. Melodic guitar weaves line across the top. Keyboards also serve as the topping. The saxophone solos, too. The vocals are rather distant. This is definitely more of a modern sound than a lot of the other stuff. It’s no less Hawk-like space rock, though. Acoustic guitar starts things here. This is another with more of a modern take on the melodic, but energized, space rock sounds of the rest of the disc. They take this one through a number of changes. At times it rocks out a bit more. At times it’s mellower. It’s always effective and compelling, though. There’s a full on shift to a faster paced, more mainstream modern progressive rock jam later, too. This does get a bit strange near the end. Weird computer sounds open this. Then it powers out to driving space rock jam. This one really feels like it could be some long lost Hawkwind tune. This thing gets pretty crazed before it ends.